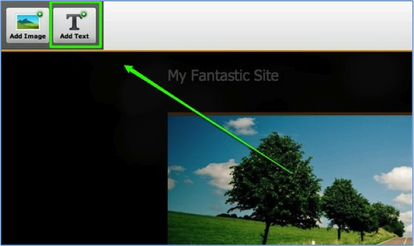 The header area of your site can have text as well as images. Adding text is as easy as clicking the Add Text button from within the ImagePerfect editor. 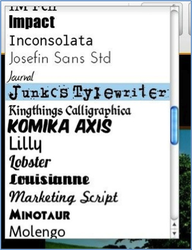 And writing your own text is a matter of clicking within the text area and typing away. You can add multiple lines of text by continuing to click the Add Text button. The editor includes a full range of options for editing this text. 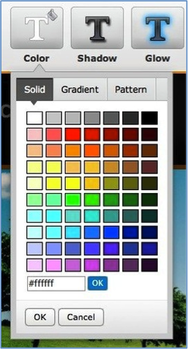 Change the color using solids, gradients, or patterns. Enter the HTML color code for the color you want if you don't see it in the palette. Add shadow with the provided slider. And use the arrows to determine from which direction the shadow is being cast. 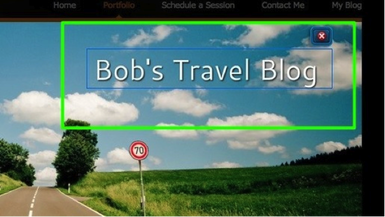 Add a glowing, colored border around the text using the glow slider. 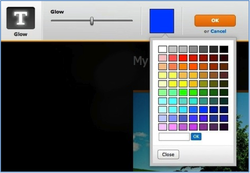 And select the color you want using the provided palette. If you're not sure how you want your text to look, play around with the settings. It's very easy to go back to the default if you don't like the changes you've made. You don't have to use the same header image on every page of the site. You can use one header for the Home, another header for your Contact page, and another for several other pages. This is done with Multiple Headers.